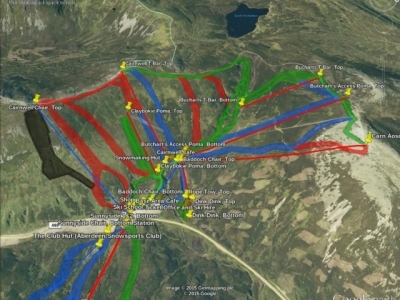 This overlay shows lift and piste information from the Scottish Ski areas. 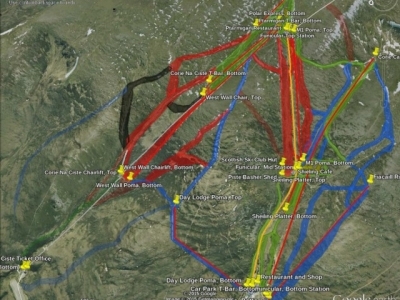 The full overlay includes historical information, un-built proposals and fantasy improvements. Updates are made when lift infrastructure changes, when I gain access to new historical information or spot something new while out and about. So please come back from time to time to check for updates. 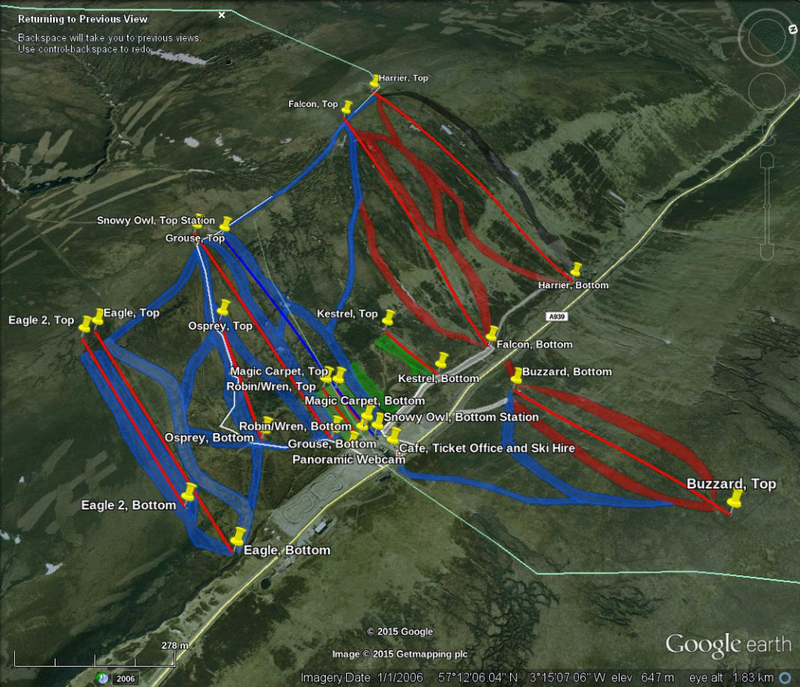 If you want to download the areas as separate .kmz files, please visit the ski centre pages linked above. This overlay is licenced under the Creative Commons Attribution-ShareAlike (CC BY-SA) licence, so feel free to edit and create your own derivatives. I try to keep these overlays up to date and like to think that they are reasonably accurate. However, please do not assume that I have gotten everything in these overlays correct and always believe what is in front of your eyes when going down a ski run. Please do not follow my routes over a cliff! 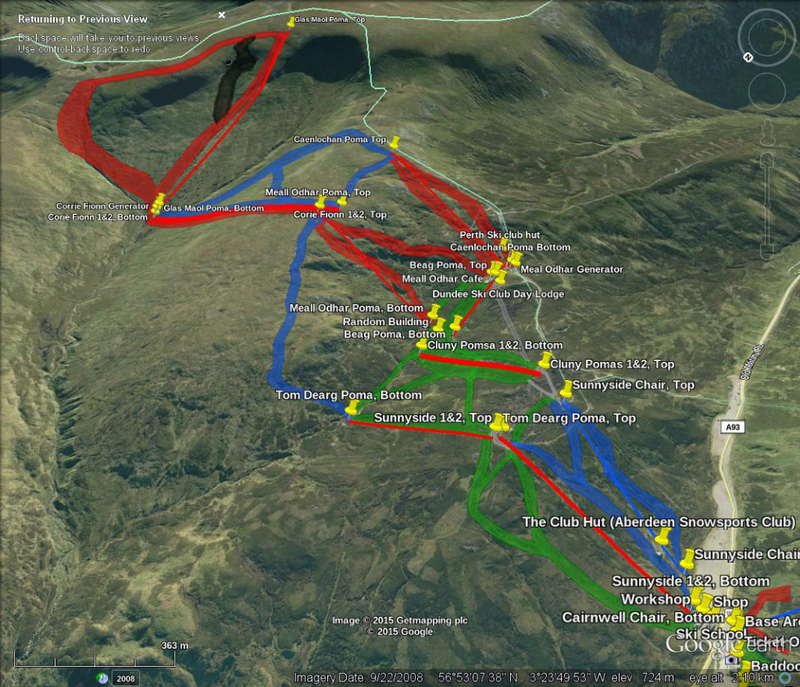 The only significant inaccuracies are in the Nevis back corries, for which I do not have GPS traces and there are no obvious terrain features to allow for accurate run mapping. Note: It used to be possible to view these overlays directly in Google Maps on a web browser simply by clicking a link. However, Google have now disabled this capability and require you to import the KMZ file into your Google account before it can be displayed. There is a 3rd party tutorial which describes how to do this. If you can’t view the KMZ file, then these image renderings provide a simple alternative so that you can see the result of my work. 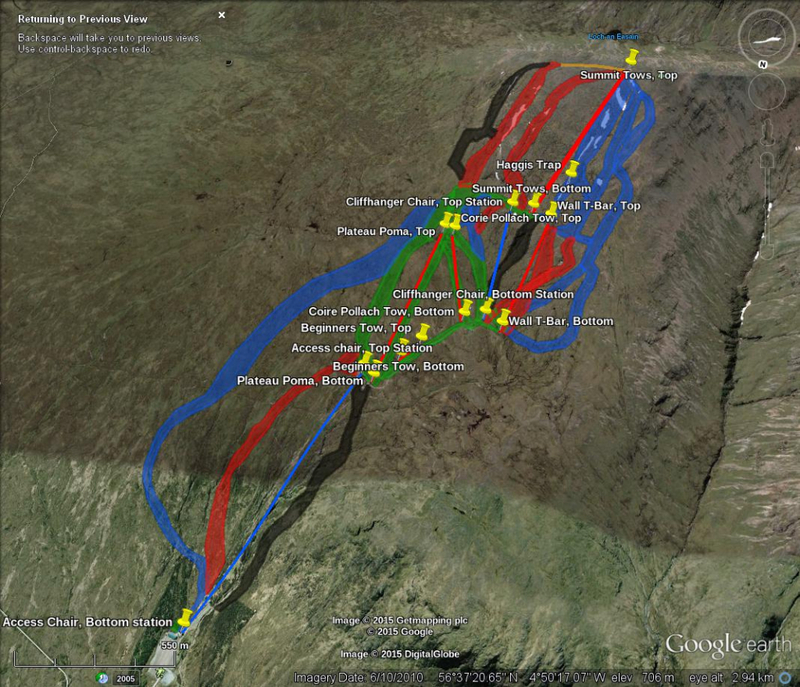 Added the Glenshee “Masterplan” information to the proposals section. The Corie Pollach Tow and associated runs are now in the correct place. 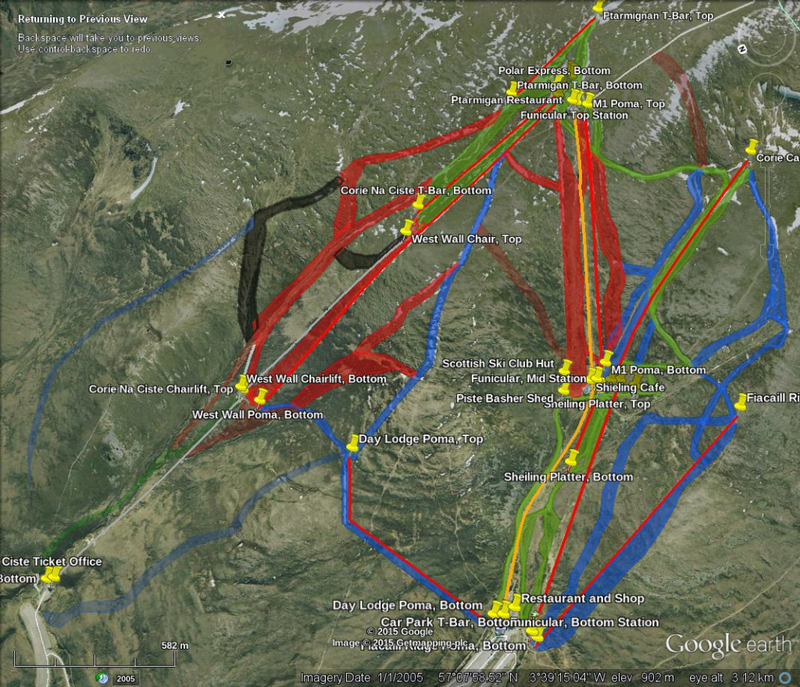 A few minor run re-alignments at Glencoe. Added the “Penguin Park” at The Lecht. Lowther Hills lifts are now correctly positioned. The Cairnwell chair is now listed as a triple. 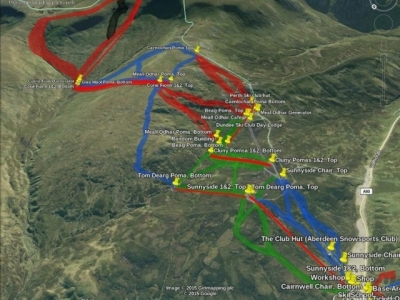 The Corrie Pollach tow at Glencoe is no longer a proposal. The Sheiling trainer tow is now described as a “handle tow”. 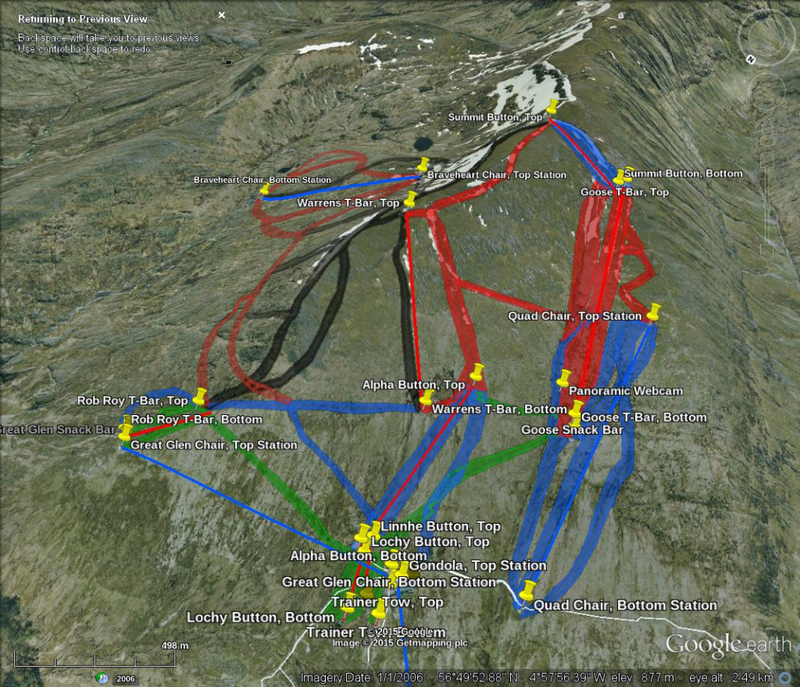 Added in the Glencoe Dry slope and approx location of the proposed new lift for Old Mugs Alley. 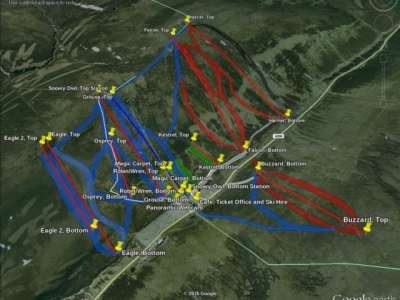 Also added the new club ski area in the Lowther hills. Better positioning of the Glencoe dry slope. 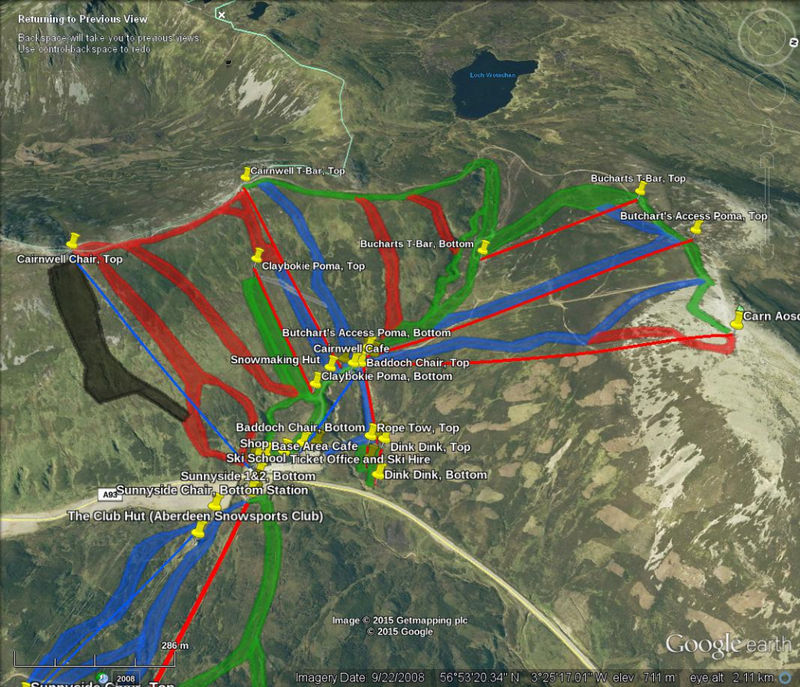 Meall Odhar T-Bar moved to the historical lifts section. Added in the proposed new Chair lift at Glencoe and tweaked the position of the proposed button for Old Mugs Alley. Added a “fantasy” expansion at the Lecht.